Creating a beautiful, practical home can be challenging. Getting the look you want while staying within your budget can seem impossible. At Surrey Marble and Granite we work directly with you, which means that you’re in control of the look, the quality and the budget, and at the same time know you’re getting expert work and direct-from-quarry prices. If you come in with an idea, even if it seems like a wild dream or a photo of a celebrity’s kitchen, we can talk you through how to make that dream a reality. Thanks to modern technologies, stone has become much more affordable with stone kitchens dropping in price even in the last 10 years. This means that stones and fabrication techniques that were once reserved for kings and emperors are now affordable for a family home. At Surrey Marble and Granite, we’re happy to work on projects of all sizes and all budgets, from replacing a kitchen counter to a multi-million pound restaurant refurbishment. Many of our staff have taken their work home with them, using their skills to create their own marble bathroom or granite kitchen worktop. As a result, we offer practical and down-to-earth advice that takes your priorities seriously. We realise that it can be hard to get a thorough understanding of the differences between stones, cuts and polishes through a computer screen. While we’re constantly working to improve our website, and the information available to you (do email us if we missed something!) we strongly recommend that you visit us in person. At our sample gallery, you touch and handle cut stone while one of our experienced stone workers answers any of your questions. 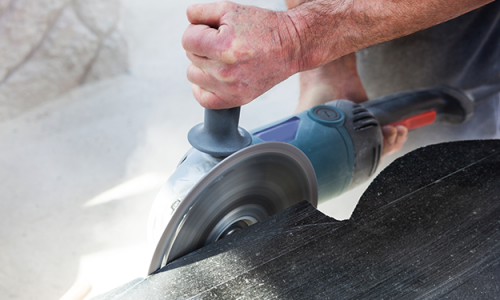 It’s the perfect way to find out what the difference is between black marble and dark granite, processed and natural stone, rough and smooth polishes, rounded and bevelled edges. You’ll be able to see different types of stone at different stages of production, and choose based on colour, pattern and style. When it’s first quarried, stone is shipped in large blocks and even the finest Italian marble can look rough and dull. Fabrication, polishing and finishing transform a stone, bringing out the hidden natural beauty. This is even true for engineered and processed stones. 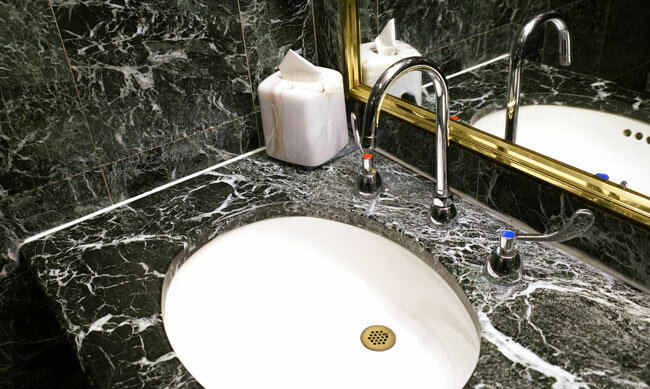 These modern marvels use small particles of natural stone, such as quartz. The particles are bonded together in a way that makes them very nearly as strong as natural stone, but provides many more options in terms of colour, style and pattern. 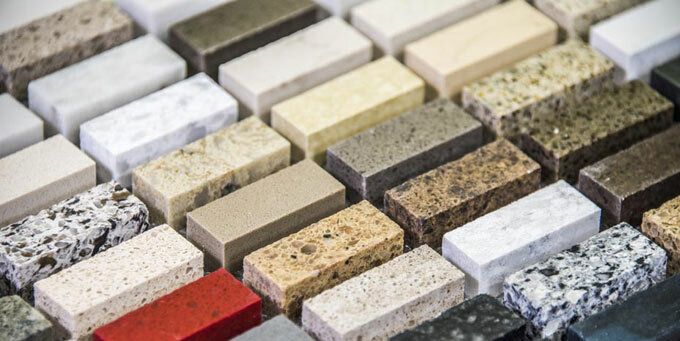 Engineered stone typically has a much more consistent look overall, and more dazzling colours. As an example, Silestone comes in bold, primary colours while Samsung Radianz Quartz can glitter as though it was scattered with gold dust or diamonds. Although we’re primarily a fabrication workshop, that doesn’t mean we don’t welcome visitors. We’re open most days (call us to check or make an appointment) and are always happy to greet you and show you around our facility. Depending on the work we’re doing, you may be able to visit our stone cutting floor as well as our gallery. Ready for a kitchen makeover? You don’t need to replace your entire kitchen at once to get a great deal and make a real difference. At Surrey Marble and Granite, we have lots of options that will help you refresh your kitchen now, while also laying the foundations for a complete overhaul in the future.